"Vertex Market will create an ecosystem that will change the ICO industry"
Cryptocurrencies are a class of digital assets that we find in the market, whether to store, buy or exchange in the encrypted market. Without the blockchain technology, many of the cryptocurrencies that we find in the market today would not exist. In many cases, behind these digital assets there are large projects that are altering the current economy and in many cases transforming the "real way" of conducting business. Like any financial market, there are many opportunities in the exchange of these assets. An initial offer of coins or ICO is a form of fundraising that exchanges future cryptocurrencies for those crypts that are already well established, such as the coins we already know (bitcoin, ethereum, litecoin, dash, etc.). The way to evaluate in which ICO we can invest to obtain returns of our investments is a challenge, since many new OICs are appearing in the encrypted market. Vertex Market facilitates this research process. Its objective is to make sure that we participate in a genuine ICO and get a return on our investment. 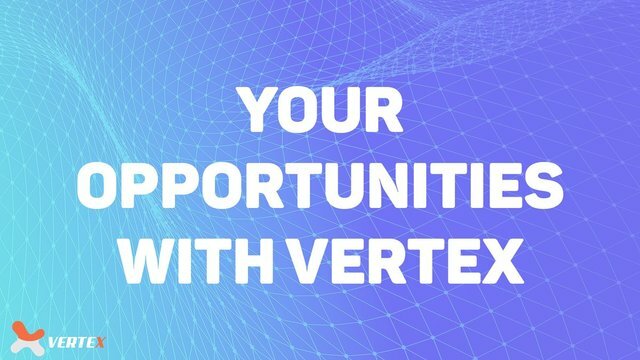 In the Vertex aftermarket, we can buy the ICOs that are successful or have more chances of success and that are likely to be included in stock exchanges. The ICO will be included in the Vertex Market after an extensive research process. Revolutionize the ICO industry by offering investors solid opportunities in the spare parts market to obtain returns and attract more fiduciary resources to the cryptocurrency markets. To guarantee users a high performance market through a financial ecosystem for investments in cryptocurrencies through its platform. What type of benefits it would offer for the users? 1. Buyers of ICO: Buyers will be able to acquire in ICO choosing first line projects through the rigorous selection process of Vertex. In addition, they will obtain preferential prices on the platform with a fair system that gives each user the opportunity to buy any project for sale offered on the platform. 2. ICO: Each project that meets the necessary requirements will have a benefit of early purchases that inject funds into ICO, expose the project to a group of users and have direct access to the incorporation of users. 3. Another important benefit is to raise the quality levels of each of the projects that are launched in general, because when examining the ICO through its rigorous process, the Vertex platform will become a standard support in the industry that buyers will admire. Who will benefit from Vertex Market, and how would the platform and the aftermarket work? Vertex is a unique ecosystem for investors. It offers them the opportunity to buy chips, even after they have run out of private sales, under much better conditions and prices than during the ICO. The Vertex platform will be powered by Vertex tokens, which will be used to invest in the tokens examined by the platform. Users wishing to invest in an ICO project must own Vertex tokens in order to purchase the desired ICO tokens. What are the current problems in the crypto world that Vertex Market would solve? The blockchain and the world of cryptocurrencies is revolutionary. They have the potential to change the lives of people around the globe as few other technologies have ever done. Thousands of projects are creating tools with this technology, obtaining the funds they need through initial offers of currencies (ICO). However, this revolution borrows principles from the world that it is trying to change; and although disciplined investment should be one of them, it is often lacking. Vertex aims to solve this by bringing in experienced investors who have been involved in some of the most important companies in the world to investigate ICOs for investment, using an unprecedented level of experience. Vertex seeks to take advantage of its experience to investigate the ICO, buying those that it considers most successful. Those ICO tokens will be offered to the Vertex community, which will use the Vertex token to buy them on the platform. In the process, Vertex is creating an ecosystem that continually injects capital into its ICO market, offering investment opportunities with a probability of good returns and providing disciplined investment and traditional investment experience in cryptography.